potentially making the world economy 100% accountable. taking responsibility for the true shares of our costs to the future. … calls for balancing costs and benefits, no longer just counting operational impacts locally as before, adding up only the impacts of over which we have direct control (and can’t hide). Now we need to do impact accounting inclusively, combining in one account both direct operational impacts and direct economic demand impacts estimated as our global shares of the GDP impacts we pay for. That’s the essential step to inclusive accounting, and balancing our benefits from GDP with our real shares of responsibility for the whole economy’s accumulating GDP impacts. It’s needed to guide our choices for moving toward a sustainable future. Following these notes is the original text of the World SDG proposal, to the UN Ministerial “Open Working Group 7” and the UN NGO Major Group and its Commons Cluster, for negotiating the global Sustainable Development Goals (SDG’s). It offers a “whole system accounting” method to give all stakeholders the same transparent information on measurable Environmental, Sustainability and Governance (ESG) impacts of the economy, to help guide economic choices for our future. What makes it work is a new scientific method for much more accurately distributing real responsibility of economic decision makers for their decisions. That new science, for how the world economy works as a whole, is what allows all stakeholders to see their own and each other’s real scale of impacts on the whole caused by their economic decisions. It becomes a learning tool for then guiding our choices for the benefit of the whole, creating a holistic awareness of what’s at stake for consumers, business, investors and governance, and guide efforts for achieving the SDG’s. Latest 2016 research statements, The links below are to recent UN Statements regarding how our standard ways of measuring sustainability are very selective, and leave the great majority of economic impacts on our future uncounted[1,]. My recent video comment to the UN [2,] on this grand accounting problem is in the webcast of its high level political policy forum for sustainable development (HLPF), its July 11 Session 4: Fostering equitable growth and sustainability . Watching the hour of statements from many experts, countries and organizations will show you how the UN works, and avoids discussion of our ever expanding impacts. My statement is at minute 0:40:40, and others by Youth, Women & Indigenous Major Groups are at minute 1:09:00 to 1:21:00, and quite excellent too. Our modern environmental accounting standards were based on ancient habits of not counting things we can now measure the effects of. The is largely limiting the information given decision makers to LOCAL impacts, and leaving uncounted their real shares of the GLOBAL impacts. These categorical omissions from what is counted assure that businesses, investors, government and consumers will make sustainability decisions quite unaware of most of the impacts their decisions will cause. What is excluded also tends to be the more neglected and disruptive of our accumulating economic impacts on the earth and society, and so excluding consideration of them in making the decisions that cause them. So sustainability decisions to maximize profits can also be maximizing neglected impacts too!!! We’ve never had a meaningful balance sheet for the earth, but new science and technology now makes it possible. Our accounting methods started from doing local accounting of impacts, and so didn’t take a whole system view, and that’s still the case. So leaving them out of consideration means it’s only slowing the whole economy that slows its increasing whole effects that are continuing to destroy the earth. I) The standard way ‘sustainability’ is now measured uses “selective accounting” rules, for addressing ESG impacts, for people, businesses, cities or countries or policies. It’s to count things almost entirely only for what each one directly manages. That counts what each planning group would immediately care about, but it ignores the often much larger remote effects of their commerce on others and the planet, a very deceptive one sided view. For businesses energy use, for example, what is counted is only the energy within its operations, for its equipment and the material uses it manages, or directly traced to them. Even though doing that takes a great deal of effort, it arrives at a total that is highly inaccurate and misleading, due to the more dispersed categories of impacts uncounted. II) The most general exclusion is of all impacts of financial choices, all treated as ‘zero’, though also very clearly resulting in what is paid for and profited from, by consuming all the services of the economy remotely. The largest part of that exclusion is the financial choice made by businesses to pay their own people, and so economically causing the consumption. Business use of public and private services, and paying investors are also excluded. Also excluded are all those categories of paid services impact for business supply chains. So given that we are now relying on environmental accounts for saving the earth, it’s evident that no one before had been checking what decision makers would be told they were making decisions about. III) To make real decisions on sustainability decision makers would need to accept co-equal responsibility for their choices to request, pay for and profit from their share of impacts for delivering their share of GDP. Because our responsibility for what we see happening around the world is not traceable you need to count it statistically, and the new research makes that relatively easy. It gives co-equal responsibly for directing the work of a business supply chain with the operations of the supply chain. The original research (3, 4) found the whole supply chain energy consumption and CO2 pollution of 5 times what the Life Cycle Assessment (LCA) or GreenHouse Gas (GHG) “Scope 1&2” metrics would count, using a wind farm business with heavy technology as model. For less for businesses using less heavy technology, the true impact might be 10 times what is counted, with the more disruptive remote impacts going completely uncounted. The old rules were inherited from practices for simplifying accounting and ignoring things that were hard to count. It reflect the oldest of old habits of thinking, of economies working with separate parts, when since Adam Smith everyone has known they work as a whole. IV) The World SDG proposes a data network giving access to a transparent inclusive accounting of measurable ESG impacts, a data platform. The starting point is a scientific method of dividing up shares of known impacts of the whole economy, for which any part would be responsibility. The baseline for estimating a share of economic responsibility is the decision maker’s share of the economy, initially counting every share as “average”, and then differentiating if more information is available. So as an impact calculator, any person, business, or country would enter their “income” and first see a display of the known global impacts for that share of world GDP. It would be for helping them choose how to invest their time and money, and guide policy. As research develops, ways to depart from average and take credit for lessening or compensating for impacts would develop. The principle strategy for the World SDG is to improve the decision making regarding investments, thinking of “investment” more holistically, as both “cultural development” and trying “new directions for the economy”. For operating businesses its ESG balance sheet report would be published along side its annual financial balance sheet report. All stakeholders could view the same “best available information” on all impact factors. When a new investment proposals want public recognition and perhaps qualify for support, they’d go through public reviews. First would for general scientific and economic feasibility, then financial, and then for cultural acceptance and political commitment. From initial to final reviews it would proceed as a “learning practice” going from early concept to final implementation stages. More successful proposals might be seen as “transformational” and become a teamwork of all the stakeholders, not just the initiators. EI (economic impact) measures accumulative responsibility of participants in the economy for shares of global ESG impacts of GDP, assumed to be proportional to shares of GDP until improved information is available. Share of GDP is a reliable measure of our use of the economy, on the currently reliable assumption that the measured economy works as a whole, based on the highly regular relationship seen in the first figure below, of a constant ratio of constant whole system growth rates for GDP, Energy & Energy Efficiency. Why a World SDG is both possible and needed is because our world economy works as a whole. We need a truly global way of understanding the impacts of our decisions, to crate a “Knowledge Commons for Sustainability”. We recognize that every part contributes to the whole and no part can operate without the whole. The surprising result of the research is how reliably any share of GDP is likely to be “average” and pay for about the same share of world GDP impacts (4). 1) It first comes from how widely distributed consumption spending is, then 2) how widely money from any expense is distributed in the global economy, to all income levels within all kinds of businesses, as it is passed down a supply chain(5a,b). It then also relies 3) on how truly global and competitive economic markets and services are, with all parts being disciplined by the same competitive standards for profiting from the resources everyone has access to. So the baseline assumption that shares of GDP pay for the same average share of GDP impacts is both necessary as a default choice and likely to be accurate. Making decisions on how individuals and the world can depart from average would then become the focus. Compare our shares of World GDP benefits with our shares of its measurable Ecological Societal and Governance (ESG) impacts. using the sound initial baseline assumption of “average responsibility per share” pending more complete accounting. It would provide an accurate accounting for the modern world’s survival on earth. so people can better understand our economic choices. Finance motivated to invest in the SDG’s close to our hearts. An integrated balance sheet of local and global responsibilities for integrated implementing of SDG’s. New science makes it possible to give those who profit from growing our costly economic impacts the information they’d need to understand their growing global liability. What would be more profitable choices for all can then reverse that. It’s shocking, really, when one finds what a $1 dollar share of GDP (where the averages apply) is responsible for, as a $1 share of today’s economy’s fast growing impacts. 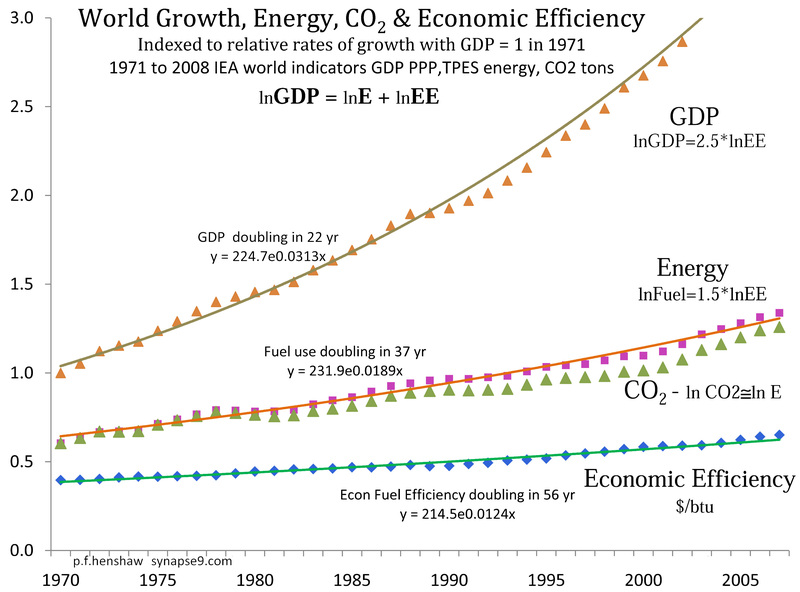 Every average $1 of GDP is responsible for close to 1lb of CO2 put in the atmosphere! So in a sentence you just replace “dollar” with “pounds of CO2” to speak about the climate impact of normal earning and spending. For a consumer with a $50k income, the climate impact is 50k pounds of CO2 per year! 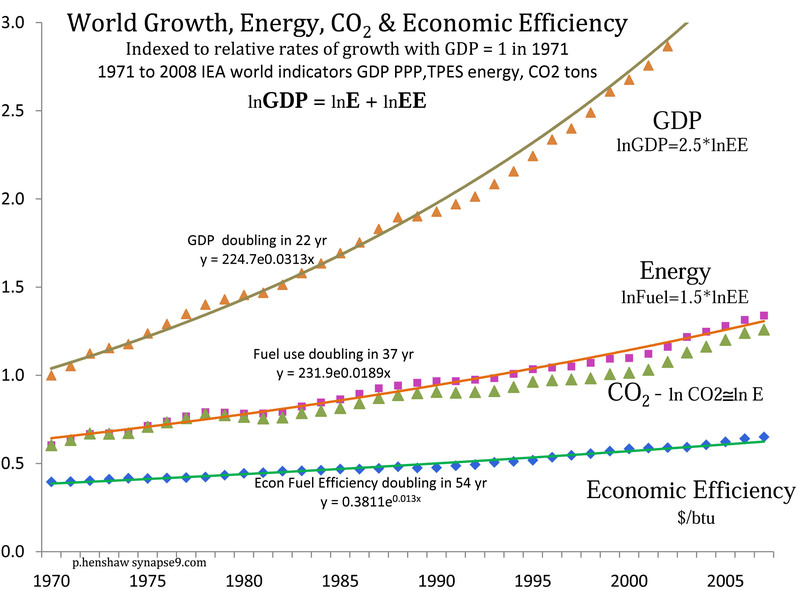 Parallel growth rates for world GDP, Energy, CO2 and Efficiency => make average shares of GDP responsible for the same share of those parallel impacts. The worst part is that including other economic impact costs, it probably exceeds $25k per year in future societal liabilities[a], just for the impacts of the CO2. [ a. $25k is an educated estimate for scale, based on an optimal $7,500 cost for using bio-char to sequester 25 tons of CO2.] There are also many other societal liabilities for economic impacts we have shares in too. We also have the strains of growing inequities, of the maintenance of aging complex infrastructure, the sudden shifts in competition stranding valued sectors of society, and of course growing public debt from the burden of the costs, as if a public subsidy for businesses neglecting their own futures, resource depletions of all kinds. For CO2 the costs include needing to replace the world’s energy systems, recover from major economic losses due to coastal damage from rising oceans, the greatly increased risks of disasters and drought, the decreased productivity of oceans and arable land, among others, further unsustainable impact on bio-diversity. The people investing our wealth are acting as our fiduciaries with a legal duty to invest wisely for us, need to know about the financial liabilities they’ve been overlooking in our names. Our growing “externalities” are depleting the resilience of all natural systems on earth and of all human societies at the same time, making everything we rely on more hazard prone. What the World SDG envisions is a standard World System balance sheet, one that would display our individual and collective shares of responsibility for the environmental services causing the impacts, that providing our fraction of GDP requires. Equating our share of GDP with a responsibility for shares of its total impacts is one of those “simple” concepts that is usually accurate too 4. The balance sheet would also put the measurable financial benefits and liabilities for them, side by side too. Seeing it laid out like that we’ll understand that paying for ever growing impacts cannot be a free service of society, as business has treated it to date, and we’ll take responsibility. Historically we have priced our future resources at $0 value, because nature doesn’t take money, encouraging unwise decisions to invest in ever growing impacts, also valued at $0. The new standard balance sheet can start with those impacts we can measure, with costs for the ones we can reasonably predict, and become more comprehensive and complete over time. Every business would compile and publish it in annual reports, so all levels of decision making in the world to see. Then everyone will understand from the grass roots to the wealthiest of the wealthy, the sciences and governments, will all see the situation, and great need for making economically, environmentally and culturally sustainable choices, fulfilling mankind’s SDG’s. At first a UN sponsored institute, somewhat like the IPCC, would lead the collaborative development of this model design for how to provide everyone on earth the information people need for understanding their individual and collective responsibilities for the economy’s known impacts on the earth , to better understand the goals and targets toward which their efforts need to be aimed. Led by the HLPF, the World SDG would end up shifting large quantities of investment funds from unsustainable to sustainable investments, both steering the developed world onto a sustainable path, and drawing investors into fully funding the several special SDG’s near and dear to everyone’s heart. I call them the “bright green spots” valued as having high impact on steering the world toward true sustainability. It would fund well-planned development ventures: to eliminate cultures of poverty, equitably manage fresh water, create accountable governments, saving the diversity of life. It would do it with competitive holistic entrepreneurial planning, as that’s what would become most profitable as sustainable development. It would completely reorient our world financial systems, providing clear purposes beyond just accumulating money, offering hard and clear measures of the sustainability of finance too, and the societal costs for how finance steers the economy their profits might be held liable for. It would make very clear that needless delay or failure to achieve world sustainability would be unacceptably costly in every way. § Economic investors, businesses, consumers and regulators will make better choices in their own and our common interest if they have information that shows them. The future would come to have economic value. Choices with delayed effects would then be valued in the present, such as if simple rules about capital gains treatment depended on the societal liabilities incurred, effectively internalizing all measurable externalities. § The scientific method 4 for measuring individual and collective responsibility as a share of our global economic impacts is already available, and can be successively improved upon with further scientific study. § For all natural systems, growth comes before sustainability, first for expanding its structures and uses of its environment, and then to stabilize, securing its niche and relationships within others. It makes the goal of “sustainability” a transition from using the economy to consume and control ever more of the earth as a rule, to making the earth our home by caring for ourselves and our place in nature. We have always needed an SDG for reducing our global footprint, in a way that would thoughtfully manage world economic systems to do so. The secret to it is having a method for informing businesses, consumers, investors, regulators and markets, on the impacts their own and each other’s decisions cause. The barrier has been the two extraordinary gaps in the information people have had, for making economic decisions. Those are what the new science changes, exposing how economies are guided by searching the world for what’s profitable, and how to include in the accounting both the costs people can count and their fair shares of the costs of the whole people can’t directly count. 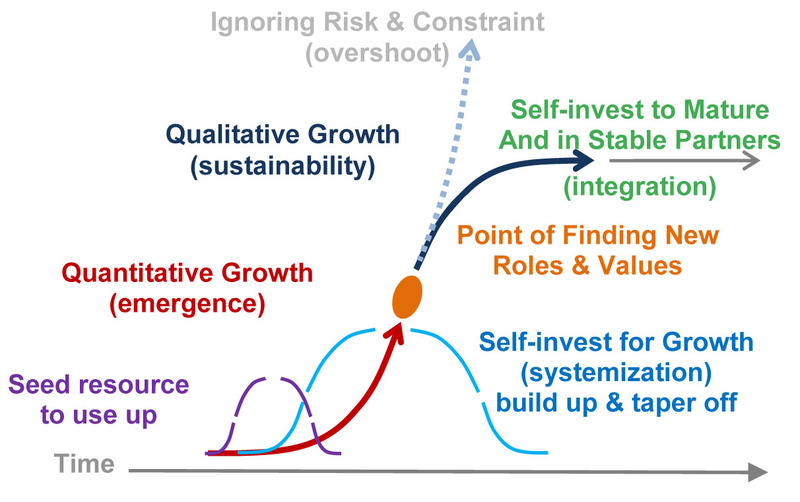 How economies evolve is more like organisms, with highly distributed decision making, developing by organic growth, following market choices for connecting resources and needs around the world as every part creatively searches their own environment for ways to further their interests. The information on our economic impacts has previously left out the distributed impacts we pay for when purchasing goods and services but can’t trace, often 4 or more times the impacts anyone can trace. Even the visible impacts were not put in terms of the economic values on which decisions are mostly made, as accumulative costs to our future, so the information didn’t alter decisions. Some of the scientific methods for matching economic choices to environmental footprints are for tracing direct Impacts, like LCA2 (Life Cycle Assessment). Others estimate responsibility for shares of renewable resources, EF 3 (Ecological Footprint), and EI 4 (Economic Impact) combines those with shares of responsibility for known impacts that other methods leave unaccounted for. There are also various scientific aggregators of ecological, social and governance impact data (ESG) as qualitative impacts associated with economic causes. Combined with the financial liability for the impact responsibilities that can be priced, the integrated balance sheet, or Total Balance information would be used to let the markets , regulators, investors, businesses and consumers all make more profitable decisions using their roles to steer the whole. The principal goal is to guide our World System toward a profitable and comfortable relationship with the earth, following a path of profitability. 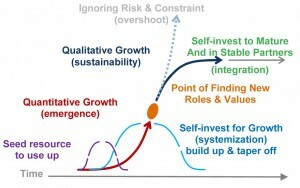 From a natural systems view, sustainability is a shift from investing in quantitative to investing in qualitative development. Long term profitability would guides every part of society as it searches for its own interests, leading the whole toward being sustainably and profitable, creating the world we want, and our home on earth, as a commons shared with the rest of nature. 2. Set standards for business annual reports on combined present and future impacts. 3. Design of the information systems for presenting crosscutting profiles of both economic and cultural data, to allow discussions for all interests on the Total Balance of their choices. 5. Obtain market funding for sound business plans responding to long term cultural and environmental interests. Restoring the original meaning of “fiduciary” back to being a duty to serve the interests of the “person” for whom professional services are given, not just their the financial gains, so the operational meaning would naturally become to make decisions for others that are measurably sustainable. The actual text the 2014 UN statement of Post2015 SDG’s could be fairly simple. “We commit ourselves to the ‘World SDG’, as a unified approach to integrating all the SDG’s, informing people of their individual and collective responsibilities for our impacts on the earth and costs of their choices to our future, for coordination by the HLPF and UN agencies. For tracking a system for monitoring global data and responsibilities for the earth system, indicators to indicate its success would include those for the design of the information system, including ways to rate information displays for Transparency, Accuracy, Relevance, etc. Implementation would involve different kinds of test launches, in different communities, to study the methods that are most useful. To track both the economic as well as cultural and environmental success, rating by the business community on how helpful it is for entrepreneurial decision making and cultural understanding of the societal choices made. The first steps would follow from the world conversation among nations, to follow the publication of the 2014 Post 2015 SDG’s. Then based on that, the next big step would be to involve getting the professional communities most needed for the project, to become engaged In it, maybe with each having a “design competition” for their roles in the process, a fairly exciting prospect in itself. It’s rather inevitable that we will find out how very unprofitable our present economic course is, acting as if intent on continuing to double our demands on the earth and ourselves too, several times a century, for as long as we can. There really is no form of technology that would permit ever growing consumption without consumption, as sometimes called “decoupling”. So rather than trusting in mirages, the responsibility is to learn better places to put our money, to make the earth profitable and comfortable as a place to live and call home. 2) LCA is the world standard method for assessing traceable impact, and the one on which most others are based , EF is footprint accounting method of the Global Footprinting Network. More work is certainly needed, to identify good strategies for individuals, communities, countries and business and for managing their value trees. Most thinking to date has been on expanding the economy more efficiently, using very selective accounting of impacts that disguised the real effects. Over the years efficiency has improved greatly, but impacts kept increasing at compound rates even faster, rather than reversing as intended. Not having an accounting method to tell us the real effects appears to have been very misleading. With inclusive accounting, a share of GDP is initially assumed responsible for the same share of GDP impacts, personal choices to reduce your personal impacts would no longer be by buying different things. Tour total impact on the earth would still be proportional to your income given how money flows in the economy (4,5). How you’d make your difference would be by investing your life differently instead. Somewhat the same would apply to businesses, no longer maximizing profits and the “creative destruction” that it most often comes with, but learning to study the disruptions being caused and find ways to really compensate for them. Choices for individual investors would center on pressuring your investment manager or broker to learn how to invest for true sustainability. It wold not necessarily be to divest old systems, but perhaps more strategically to use their wealth as “cash cows”, to invest in business pathways for achieving real sustainabilty. In nature change is a ladder of steps, starting small and ending small, with sometimes extremely rapid change in the middle. For society the choices would focus on strategic planning, like expanding and retraining the SD designer community, and provide consultant/facilitators to multi-stakeholder projects, as seem really needed for the new kinds of teamwork that will and need to develop. It would all be breaking with quite ancient habits, and make a lot of things seem to require a “whole new way of thinking”, like learning to use a whole system accounting for relating to the earth as a whole. So part of what’s important is that literally everyone will need help, both with learning and getting over the long term habits of denials that kept us from seeing these now mounting problems as imminent. It may just confuse a great many people too, until the graphic evidence of what huge trouble we’re in gets us to take it seriously. If done ‘efficiently’ we’d do it ‘naturally’. We’d start making progress as with anything really new, taking stock and finding a vision for what to do, then with careful small steps and experiments set a direction for bigger ones, building toward a common practice, and becoming solid once really under way. b. What’s “Scope 4”, and… Why all the tiers?? The peer reviewed research (4) explains the test model and method of accounting. A business balance sheet is assessed line by line, combining any directly measured impacts with statistically measured impacts. Reference (5a,5b) explain the details of how money flows through a business “value tree”, like the diagram below, and why that matters. The following three paragraphs may be enough to generally explain it for most. 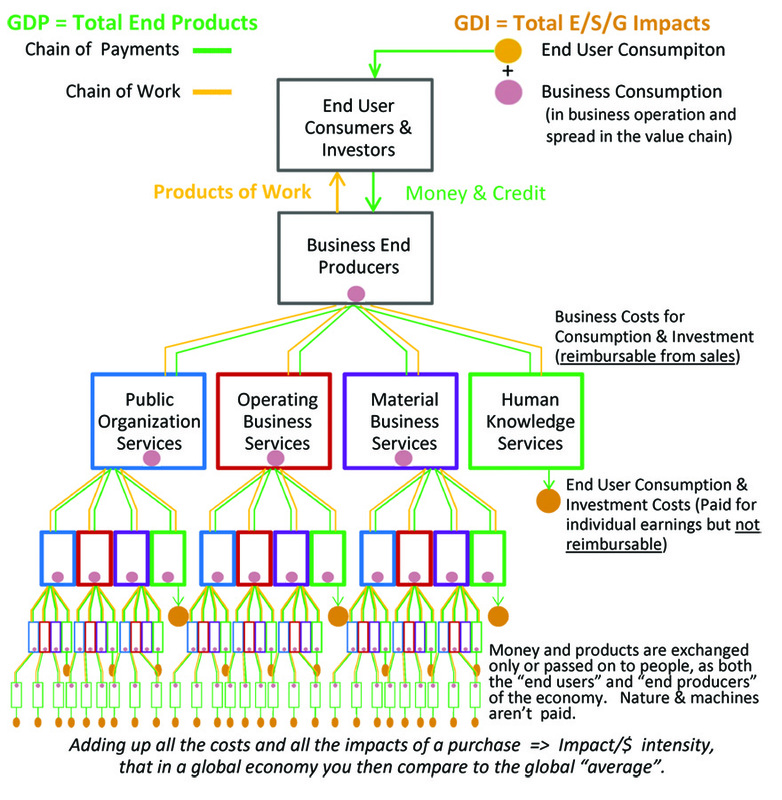 We start from the components of GDP , as the sum of investor and consumer spending, each paying for goods and services produced by business value trees, the money being passed down the tree and products and services passed up (figure below). Alternate models and real comparisons with many kinds of working value tree networks clearly need study. The general principle would seem to hold, that money is passed to businesses to be distributed to their dozens of business people and dozens of other businesses. At each “tier” of the branching chain of producer services the distribution of any dollar spent much more widely dispurses. The money being passed from one businesses might be distributed to 100 times the recipients. In five steps then going to 100^5 or to ten billion recipients. If the payment cycle is 2 weeks it means in couple months part of any dollar spent might go to paying for as many services as there are people on earth. extremely widely distributed to all types of people and businesses. One rule of thumb is that 20% of any business’s costs is for people. So at each tier of the tree the amount of money still being passed on through businesses is reduced by only 20%. Then after 5 steps of 20% (I-.80, II-.64, III-.51, IV-.40, V-.32) going to people in varied businesses with normally distributed high and low income people, there would still be 32% of the original sum that has not been paid to a person. Using 100^n to count recipients at each level, even at just three steps there would be a ~million individuals and businesses dividing up about half of the original payment. As a result a very wide global distribution seems fairly assured, and suggests it would be unusual for a distribution of kinds of consumption to be far from the global average. The equation would be quite complicated, but from general principles it means money is distributed to an extremely wide distribution of people before even half of it is disbursed. For more complete discussion see (5b) . ABOUT THE AUTHOR Jessie Lydia Henshaw represented the UN NGO Commons Cluster in the United Nations during 2013-2014, and is now consulting as a natural systems design scientist, helping others use patterns of natural change to follow the stories of irreversible emerging change in organizations, a learning approach to a general systems ecology. Her recent work has been on translating this natural science work on patterns of change into the form of Alexander’s ‘pattern language’ for describing recurrent and versatile holistic design patterns. For more information about this author and her work, see her professional biography. That was 2014. What has occurred since then with your proposal? There’s been a great deal of curiosity but not real discussion. Partly that’s due to it being so innovative and unpolitical, and social groups not seeing how to respond. The many expert groups I’ve approached are harder to generalize, often first showing some real interest and then avoiding discussion entirely. There are some easily misunderstood things that probably put some off. I think the main reason for their avoidance is that are generally serving financial interests, even the leading SD organizations, and see it as a problem to admit that responsibility for what the economy does is naturally distributed by share of responsibility for the economy. That’s an unexpectedly unfamiliar idea, with a lot of implications. Recently I’ve had more success describing how the official SD metrics of business impacts leave most of the biggest direct business impacts uncounted. One main reason is that knowledge of impacts are not passed up the supply chain, so businesses don’t know what they’re buying. The other is that no one is taking any responsibility for the increasingly costly and lasting impacts of increasingly disruptive innovation.